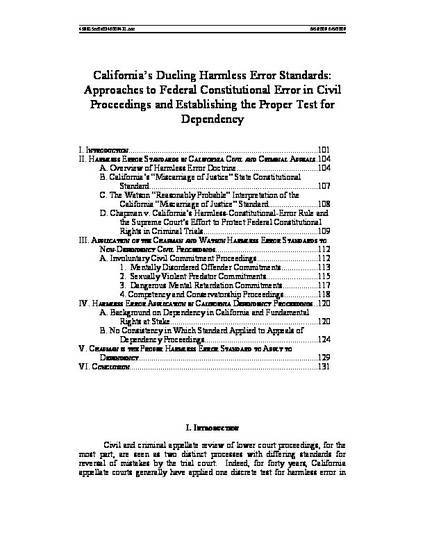 For forty years, California appellate courts generally have applied one discrete harmless error test for federal constitutional error in criminal cases and another for civil proceedings. In appeals from convictions in California state criminal cases, errors rising to a federal constitutional dimension are governed by the standard of Chapman v. California, which requires that these errors be proven by the state to be harmless beyond any reasonable doubt. The more lenient standard (for the trial court) of People v. Watson, which holds errors of state law and procedure harmless unless there is a reasonable probability that such error prejudiced the outcome, is generally applicable to federal constitutional error in civil cases.  Where a fundamental right such as personal liberty may be erroneously infringed upon, the logic goes, greater protection of such a right is required, in contrast to errors merely of state statutory or procedural nature that by and large arise in state civil trials. However, on several important occasions civil cases enter a grey area involving the suspension or infringement of fundamental constitutional rights. As a result, for the same forty years, appellate courts in the state have varied considerably regarding which of the two standards to apply in assessing the harmlessness of federal constitutional errors arising in civil proceedings. This twilight zone means that little definitive guidance exists for courts evaluating harmlessness of error in civil cases that nonetheless implicate fundamental rights. Such circumstances include, for example, involuntary civil commitments for sexually violent predators and mentally disordered offenders, conservatorship and competency hearings, and child protection and parental severance (“dependency”) proceedings. Given the lack of guidance from higher courts, California appellate courts have varied widely regarding which harmless error standard should be applied to federal constitutional errors in such civil cases. Without a clear harmless error standard established for federal constitutional error in these instances, outcomes are rendered unpredictable and the level of protection afforded defendants’ federal constitutional rights is problematically inconsistent. This Article considers the case of juvenile dependency proceedings as one example of a civil area where federal constitutional error may arise, and argues for the application of the Chapman v. California harmless error standard on appeal when rights of federal constitutional magnitude arise in dependency proceedings.